You'll have to wait longer if you want more clues about when the Federal Reserve plans to wind down its stimulus efforts. The Federal Reserve wrapped up a two-day meeting Wednesday with small tweaks to its policy statement, but its overall outlook for the economy seems little changed. The Fed characterized recent economic growth as "modest," a slight change from in June, when it called the recovery "moderate." In Fed-speak, even that small distinction could be meaningful. Outside economists interpreted the word change as reflecting a slight downgrade in the Fed's outlook. It only gets more muddled from there, though. On one hand, the central bank added a slightly more optimistic phrase, saying it expects "economic growth will pick up from its recent pace." But it also pointed to two new downsides: mortgage rates have been rising and inflation may be too low. The Fed usually aims to keep inflation around 2% a year, but recently it has hovered around 1%. "The Committee recognizes that inflation persistently below its 2 percent objective could pose risks to economic performance, but it anticipates that inflation will move back toward its objective over the medium term," the statement said. Overall, the comments are mixed and give little indication of when the Fed might slow its monthly bond purchases. The bond-buying policy, known as quantitative easing or QE3, entails purchasing $85 billion in Treasuries and mortgage-backed securities each month, and is intended to lower long-term interest rates. Some Fed watchers interpreted the lack of a timeline as a sign that the Fed may hold off on tapering QE3 longer than originally expected. "We were looking for Fed officials to put in writing the possibility of scaling back the pace of their asset purchases later this year if economic growth evolved as expected," said Dana Saporta, director of U.S. economics for Credit Suisse. "They did not. This omission makes this a more dovish statement than expected." The central bank repeated that it plans to keep QE3 in place until "the outlook for the labor market has improved substantially." It also reiterated that it stands "prepared to increase or reduce the pace of its purchases" as the economic outlook changes. New data released earlier Wednesday showed the economy grew at a 1.7% annual rate, in spite of government spending cuts in the second quarter. Although the numbers point to an economy moving in the right direction, growth is still not up to the Fed's goals yet. The unemployment rate was 7.6% as of June, and new jobs data due out on Friday is not expected to move the needle much. The Federal Reserve would like to see the unemployment rate fall to around 6.5% before it starts to raise short-term interest rates. In its efforts to stimulate the economy, the central bank has kept interest rates at historic lows since December 2008. Of the 12 Fed members who vote on monetary policy decisions, only Kansas City Fed President Esther George was against Wednesday's decision. George has dissented at every Fed meeting this year, expressing concerns that Fed stimulus could increase "the risks of future economic and financial imbalances" and lead to a run-up in inflation over time. The Federal Reserve's next policymaking meeting is scheduled for September 17 to 18, but look for more hints about the internal deliberations in the meantime. 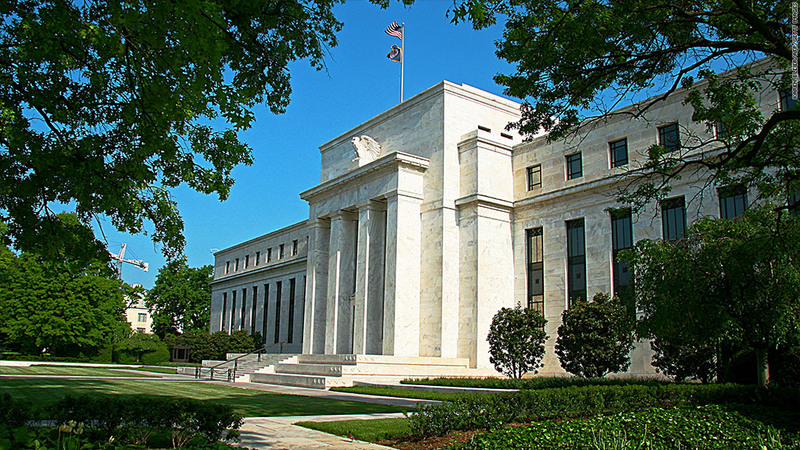 At least five regional Fed presidents are scheduled to give speeches in the week ahead. The Fed's exit strategy is also likely to be the hot topic at the end of August, when central bankers from around the world convene for an annual symposium in Jackson Hole, Wyo. Fed watchers are also looking for clues about who will follow Bernanke at the helm of the central bank. His term expires in January, and he is not expected to serve another term. Federal Reserve Vice Chair Janet Yellen and former Treasury Secretary Larry Summers are thought to be the top contenders.